of M.Tech Course offered by the institutes located in Kerala state. Candidates will be able to fill the Kerala M.Tech Counselling Application form from the official website of the conducting organisation. Those candidates who are interested in taking admission to the M.Tech course can check the below-given details such as Kerala M.Tech Counselling Procedure, eligibility, dates, choice filling and all the other important information. Under Kerala M.Tech Counselling Schedule 2017, the organisation accepts GATE 2017 Score Card for the admission in various colleges of Kerala. If after this, the seat remains then the organisation take admission of Non-GATE candidates through their performance in graduation degree. We are on this blog providing you with the information about Kerala M.Tech Admission 2017. Kerala M.Tech Counseling follows a specific procedure. it first allows seats to GATE qualified candidates and after this if the seats remained seat are allotted to those candidates who fulfil the criteria decided by the organisation in the graduation degree percentage. Candidates can check the Kerala M.tech Counselling Eligibility in the below section. Candidates are required to register themselves online on the official online portal of the organisation. Candidates can follow the instruction given below and fill the application form. Firstly, candidates are required to visit the official website of the organisation. Read the official notification carefully and check eligibility especially. If he/ she finds himself/ herself eligible then start applying. Enter all the details carefully and click on NEXT tab. Make the payment of Registration fee and click on Submit Button. The Candidates are required to create a priority list of colleges along with the subject of M.Tech which they offer. The organisation will provide a confirm seat to the candidate as per their rank in GATE 2017. The candidates are required to prepare all of these documents at the time of physical reporting to the seat allotted institution. Kindly, carry these documents along with their self-attested photocopies to the college for the verification process. 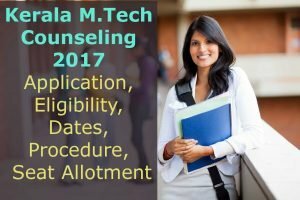 Candidates who have qualified GATE 2017 with the minimum marks decided by the university will be eligible to appear in Kerala M.Tech Counselling 2017. The candidate who is applying directly should have minimum 50% in the graduation degree from a recognised university or college. Candidates after the successful completion of Kerala M.Tech Counselling will wait for the announcement of Kerala M.Tech Admission Seat Allotment Result 2017. The organisation will release the result on the basis of the rank scored in GATE 2017 and after completing of this list seats will be allotted to the candidates according to their marks in Graduation degree. We will update the result on this page once after it get to announce on the official website.